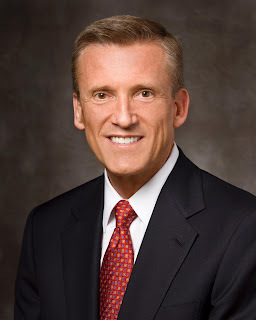 Elder Kevin R. Duncan was called to the First Quorum of the Seventy in April, 2010. (See Ensign article in html and pdf). He earned a bachelor's degree in accounting, master's degree in tax accounting and a J.D. in law, all from BYU. He was with Duncan Fritch & Hubbard in Seattle before founding CaseData, Inc. a legal technology firm. CaseData was later acquired by Océ Business Services. In 2005, he received the Ernst & Young Entrepreneur of the Year award. On a personal level, he grew up in West Point, Utah. He worked a family farm with brothers and sister. His wife died from a car accident leaving him with an infant child. He married again and had four more children with his second wife. His church service includes a mission to the Chile, Santiago South Mission. He later served a service mission as associate international legal counsel in South America for the Church. He then served as Mission President of the same mission he served in as a young man. He was serving as an Area Authority in the Utah South Area when called to the First Quorum of the Seventy. So, why am I devoting an entire posting to this particular man? Well, it's simple. I rode the same school bus he did for about three years. He was a senior in High School when I was a sophomore. It was only after reading his bio in the Ensign that his hometown "West Point" Utah hit me in the face. This is the area where I lived. Looking more closely at his picture, I realized I remembered him, from the bus. This prompted me to closely evaluate my yearbook. I looked up his senior picture and all his activities. He was in the pep band, orchestra and an academic scholar. He went to Boys' State, and was a member of the Vocational Industrial Clubs of America (V.I.C.A.). He is the same age as my future brother-in-law and graduated with him. I remember him bringing some sort of instrument on the bus. He had quite a handful of materials in addition to it. He was not a bully. I don't remember being afraid of him. Some of the guys, especially the older ones, would bully the younger ones. He was not one of these. I remember thinking of him as probably a nice guy but a bit nondescript. In fact, he was probably a "nerd." Nerd was a disparaging term for people who were not "popular" and did little to try and make themselves so. In hindsight, it is clear that he was simply a diamond-in-the-rough. Or, maybe he was already a diamond and it just wasn't obvious yet. It is obvious now. Knowing he has been called to significant responsibility in the Lord's service strengthens my faith. If Church leaders are like this man then we can look to the future with hope, confident that the Lord's business is being handled by good and dedicated men. It is clear from this Church News article that he initially volunteered before specific callings came. He did not stay in business amassing more and more money. He apparently had enough and then chose to devote his energies to the Lord. He had a very young family at the time. "I love to work . . . If the Lord wants a worker, then I can work." Burundi and Angola: Branch President AND Relief Society President?